The Quiet Bride: In Love With Our Website!!! 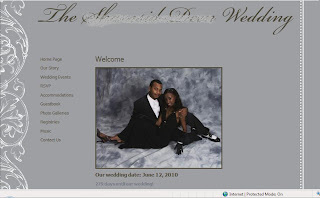 Wedding websites are great! I've created one myself and have really enjoyed the process. I'm always re-working sentences and changing content. I understand your passion as well. I think this is the funnest thing I've done since I started the wedding planning process. I'm sure your wedding guests are going to love it. I can attest to that. My wife and I went through mywedding.com too. She was on it way more than I could ever think to be, but I did appreciate that it was really easy to put together and customize and whatnot.